The Northeast's fall foliage dazzles locals and draws millions of tourists, but many flock to the same tired vantage points. Those willing to venture off the beaten path will be rewarded with stunning and comparatively uncrowded autumn vistas - and some killer selfies. Getting to the tower involves a relatively easy 1¼-mile hike up a foliage-filled trail that winds up the mountain with plenty of overlooks of the Farmington River Valley. There's also a nearby pumpkin patch where visitors can enjoy hayrides and pumpkin picking. Nestled in tiny Turner in the foothills of Maine, Ricker Hill Orchards combines two of New England's most beloved autumn activities: picking your own apples and admiring the turning leaves. 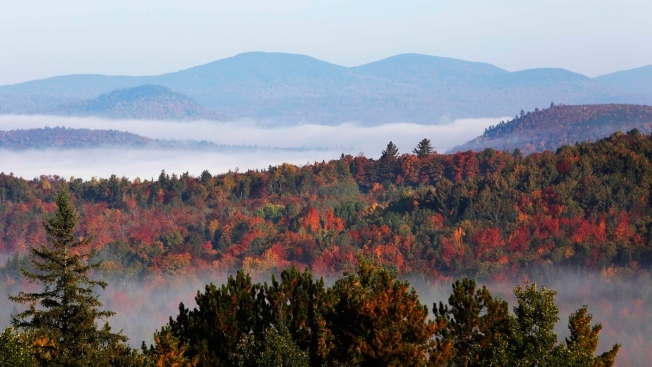 The orchard's hillside "u-pick" area offers a stunning view of Maine's western lakes and mountains region, with views of foliage stretching all the way to New Hampshire. The ninth-generation orchard also offers fall staples such as cider and cider doughnuts along with its apples and views. It's about an hour's drive north of Portland - a ride with its own superb views of the fall spectacle. Cross over the Sagamore Bridge and take the first exit onto rural Route 6A, which winds and twists through the scenic and historic town of Sandwich. The Old King's Highway, as it used to be known, hugs Cape Cod Bay and is lined with ancient stone walls, white picket fences, ponds and pastures. Don't want to limit your leaf-peeping to a single state - or, for that matter - country? Head to Milan State Park, where a fire tower offers simultaneous views of the mountain ranges of New Hampshire, Maine, Vermont and Canada. Oh, and it's pronounced MY'-lin, not mih-LAHN'. While the more adventurous can make a 1.5-mile hike that's rated as easy to moderate, it's also possible to drive to a parking area near the top for a short walk that makes it an ideal outing with kids.